I.P.S.S.A.R. 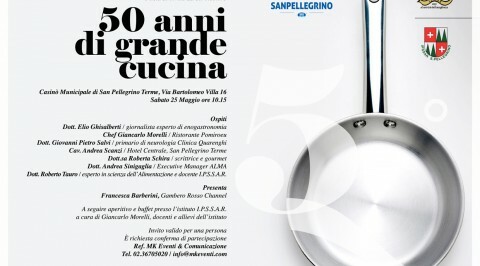 San Pellegrino Terme celebrates on 25th of May its 50 years with leading experts: a celebration not to be missed in the historic and charming location of the Casino of San Pellegrino Terme. Between nutrition and health experts as Dr. Salvi (primary of Neurology department at Quarenghi Clinic ) and Dr. Tauro (expert in food science and IPSSAR professor), starred chefs such as Giancarlo Morelli (restaurant Pomiroeu), gourmet journalists as Roberta Schira and Elio Ghisalberti and educational experts as Cav. Scanzi and Dr. Sinigaglia, the school tells its own story, its philosophy and its future involving students in an informal and important discussion . Can’t miss a moment of healthy and good food by Giancarlo Morelli and students of the school.